Heinz Propper is a life-long friend of Kossoff’s. They met while serving together in the Jewish Brigade after the Second World War. 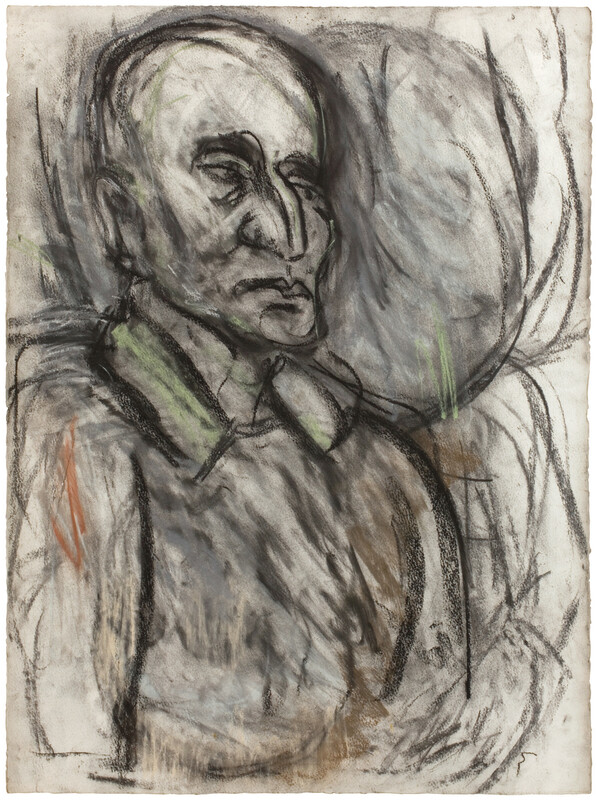 This drawing was publicly exhibited in 2000 with another drawing and three paintings of the sitter. All five works were made in 1997 and 1998 and all five works depict Propper’s head and shoulders. His striking physiognomy is especially prominent in this charcoal and pastel drawing. Further works of Propper were painted in the late 1980s. This drawing suggests several important developments in Kossoff’s late style of draughtsmanship. By comparison with much of his output prior to this date, Heinz Propper is executed in a notably lighter, less tumultuous style. Rather than covering the sheet with markings, the sitter has been situated in an open space. The right-hand edge of the drawing is worked with long, sinuous strokes of charcoal, rather than the clustered lines familiar from earlier work. A sparing and inventive use of coloured pastels has also been made, with ochre pigments on Propper’s right arm and torso, and a luminous green pastel along his collar, jawline and the space before his face. There is a ghostly pentimento to the right of Propper’s head, a shadow of his head’s fixed outline. The impression is of the sitter moving, at first lulling forwards and then sitting back in his chair. Rather than begin afresh on a clean sheet, Kossoff has rubbed away the old outline and redrawn the figure with characteristic rapidity. The result is of something layered and considerately executed – not merely the work of a moment, but rather of a thoughtful and extended process.